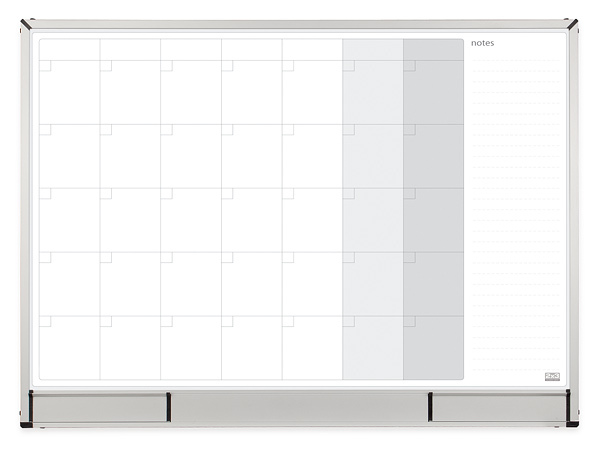 Magnetic planning boards StarBoard | 2×3 S.A. The StarBoard series board first of all means a functionality, modern design and exceptional quality. Dry erase surface with magnetic properties. Permanent grid pattern for periods of planning weekly, monthly or yearly. Aluminium structure in silver color with matt black finish. Two shelves, built-in in the lower profile of the board. Back side of the board strengthened with a zinc coated plate. Fixing to the wall by means of the hanging systems, fixed to the back part of the frame profile, and to the profile of the shelf base (there is a possibility to assembly the board on the basis of the frame profile only). Warranty: 2-year product warranty, forever for the ceramicsteel surface and 10-year for the lacquered.